For the past few months we have been trying the Britax Advansafix. Regular readers will know of my love for car seats and car safety. The first thing that caught my attention with the Britax Advansafix was the use of the 5 point safety harness up to 25Kg. 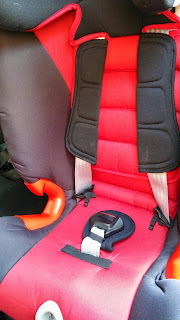 This is much higher than other Car seats were the use of the harness is normally up to 18Kg. The harness adds further security to the child and its prolonged use adds a safety element. The other factor which caught my attention was the 3 methods to attach the car seat. 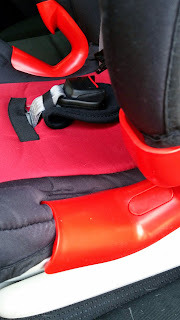 The Britax Advansafix is attached via IsoFix, Seat belt and by Tethering point. By using all three you limit the rotational movement of the seat. This has helped the Britax Advansafix pass the rollover test. As the Britax Advansafix uses three methods to secure the seat into the car it can take slightly longer than expected to install. I found it rather tricky to install the isofix which is the first part of installation. There is a grey cord to pull to pull out the isofix bars. The problem I had was trying to lock the bars. The slightest pressure pushes the isofix bars back into the seat meaning as you are installing you need to keep releasing the isofix bars. The next part of installation is via the seat belt. This is relatively simply to perform but you do need to watch as you thread the seat belt through as it can catch the back of the harness. 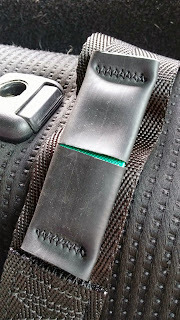 I was impressed by the top tether connection as there was a handy green square which helps you to see when there is enough tension in the strap. 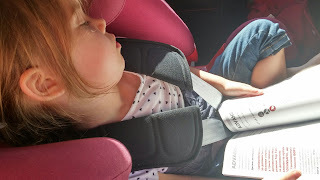 The Britax Advansafix has multiple recline position which are easily accessible and have proved to be very useful when my daughters fall asleep in the seat. The Britax Advansafix has been designed not only for safety but also for comfort. The shoulder pads help reduce forward movement in the event of a crash but they are also really soft. They tend to stay in place which helps reduce error in installation. The shape of the seat reminds me very much of a high back booster. It is slim yet with great side protection and a very deep padded head rest to give optimum head protection. There are plenty of indicators to allow you to see when the Advansafix is correctly installed. There are two features for me which let the Advansafix down. The first is the harness adjustment. The pull cord to adjust the harness can often be difficult to pull tight. The harness has become stuck on more than one occasion at the back of the seat. This has meant I have had to untangle the harness from the back of the seat. I feel many parents would assume the harness is tight enough and simply leave the harness as is, which would compromise their child's safety. The second issue for me is the headrest. I find it difficult to adjust and it also can become stuck. On more than one occasion I have had to take the seat out of the car to adjust the head rest manually. My eldest is quite small in height for her age but she is almost on the highest setting. I do wonder if it would last to the full weight limit of the seat. Overall there are many impressive features to the Advansafix that add an extra layer of safety. In particular the three connection methods and the side impact protection. What lets the Advansafix down in my opinion is the head rest and the harness tightening. I would always recommend doing the pinch test on a harness just to ensure it is tight enough, and before purchasing any car seat to check that it fits both your car and your child. Performing both of these should remove the issues that I feel there are with the Advansafix. How did you manage to fix the isofix retracting issue? I have spent over an hour wrestling with the Advansafix to try to get it to click into the isofix points on a 2012 Nissan Qashqai with leather seats. As you rightly say, the bare minimum of resistance causes the arms to retract back into the seat and makes it impossible to fix. I had to take the seat out for cleaning after daughter was sick in the car, now I can't get it back in and have only succeeded in cutting my fingers in trying. Have emailed Britax but obviously I am keen to get the seat fitted back in the car ASAP. My feeling is that this is a good idea but a flawed design. I understand your frustration and it is one I have noted in the review. I either keep trying or I hold the strap to get the isofix points to stay out and line them up with the isofix bars, so that they are almost connected. 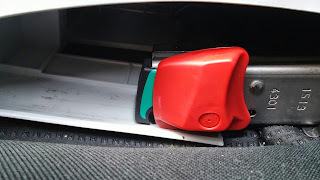 Let go of the isofix strap and then hold onto the bars and push them in to connect. It does take time.